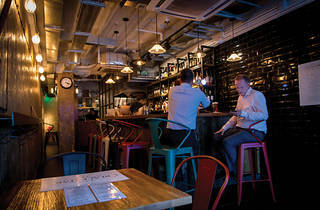 The Blck Brd opened in 2010 to a healthy crowd of Centralites seeking a change from the usual LKF clobber. 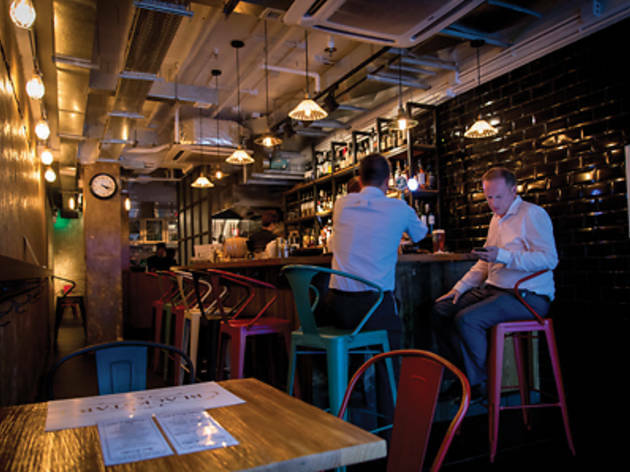 Now the bar’s owner, Dan Findlay, has turned his eye towards Sheung Wan. The Black Star classes itself as a bar, lounge and restaurant, although its main draw is the drinks list. Unlike its big sister, this hole-in-the-wall sticks out like a sore thumb in the market area, where it’s surrounded by steaming stalls of street food and fresh fruit juice. We arrive Tuesday night at happy hour and the place is comfortably packed. Its open-front plan is reminiscent of the rows of bars spilling out onto the street in Soho, but less appealing considering the view – the bar is right opposite a busy MTR station. The interior mirrors the hustle and bustle of the area in its deconstructed array of metal and brick, the lights just one watt short of a candlelit dinner glow. The bar is a long, high table filling up a third of the space, seating about 10 people. There are three little tables, ideal for twos, and a narrow floating shelf running opposite the bar for standing drinkers. As we turn our attention to the cocktail list, it is short but sweet (literally – plenty of sugars and fizzes to balance the maltier whiskies and rums). Their signature cocktail, the Old Smokey ($128), is a twist on the classic Old Fashioned. It comes with a square island of ice and a refreshing rind of lemon that gives it a citrus kick; smooth and incredibly light, the main body is a honeyed Ron Zacapa 23-year-old rum, finished with a slightly peppery Talisker single malt. The drink is a little too light for our tastes, but appropriate for a safe after-work tipple if your alcohol craving isn’t of Don Draper proportions. The second drink we try, the Morning Glory Fizz, is a refreshing, sherbet-y, absinthe-washed cocktail topped with velvety foam. Those thirsty for a beer might be slightly disappointed by the current range, but the 961 Porter from Lebanon and Brooklyn Lager on tap might pique interest.